Summary of Tai Chi Schools & Teachers outside of highlighted areas in China - The China Taichi Guide is a Directory of Tai Chi Schools & Tai Chi Teachers in China. Ou Hai Bing is one of the close disciples of Feng Zhi Qiang and teaches Chen Xinyi Hunyuan around Zhuzhou in Hunan Province, not far from Changsha. 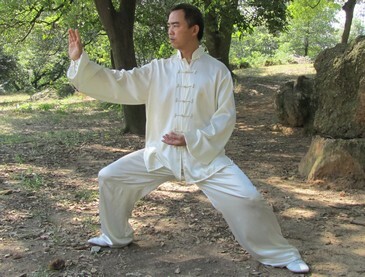 He also teaches Competition Chen 56 and Hunyuan Qi Gong. His Tai'chi movement is superbly relaxed and beautiful to watch, and he combines this with a natural feeling humility and willingness to share what he has with his students. A very nice guy. He teaches on a tutorial basis only and so this is an ideal opening for short term individual or small group training at the highest level. The China Taichi Guide : A Summary of Tai Chi Schools & Teachers outside of highlighted areas in China. The China Tai Chi Guide is a directory of Tai Chi Schools and Teachers in China.